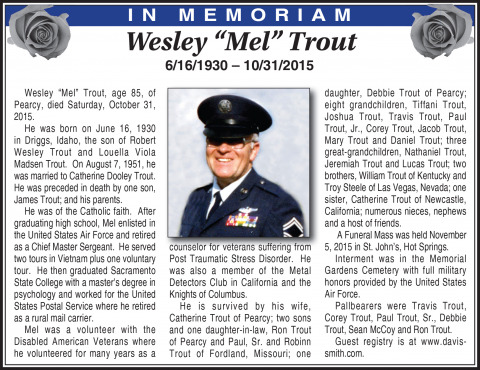 Wesley “Mel” Trout, age 85, of Pearcy, died Saturday, October 31, 2015. He was born on June 16, 1930 in Driggs, Idaho, the son of Robert Wesley Trout and Louella Viola Madsen Trout. On August 7, 1951, he was married to Catherine Dooley Trout. He was preceded in death by one son, James Trout; and his parents. He was of the Catholic faith. After graduating high school, Mel enlisted in the United States Air Force and retired as a Chief Master Sergeant. He served two tours in Vietnam plus one voluntary tour. He then graduated Sacramento State College with a master’s degree in psychology and worked for the United States Postal Service where he retired as a rural mail carrier. Mel was a volunteer with the Disabled American Veterans where he volunteered for many years as a counselor for veterans suffering from Post Traumatic Stress Disorder. He was also a member of the Metal Detectors Club in California and the Knights of Columbus. He is survived by his wife, Catherine Trout of Pearcy; two sons and one daughter-in-law, Ron Trout of Pearcy and Paul, Sr. and Robinn Trout of Fordland, Missouri; one daughter, Debbie Trout of Pearcy; eight grandchildren, Tiffani Trout, Joshua Trout, Travis Trout, Paul Trout, Jr., Corey Trout, Jacob Trout, Mary Trout and Daniel Trout; three great-grandchildren, Nathaniel Trout, Jeremiah Trout and Lucas Trout; two brothers, William Trout of Kentucky and Troy Steele of Las Vegas, Nevada; one sister, Catherine Trout of Newcastle, California; numerous nieces, nephews and a host of friends. A Funeral Mass will be held at 2:00 PM, Thursday, November 5, 2015 in St. John’s, Hot Springs. Interment will be in the Memorial Gardens Cemetery with full military honors provided by the United States Air Force. Visitation will be held from 6:00 PM until 8:00 PM, Wednesday evening, at the funeral home. Pallbearers will be Travis Trout, Corey Trout, Paul Trout, Sr., Debbie Trout, Sean McCoy and Ron Trout.